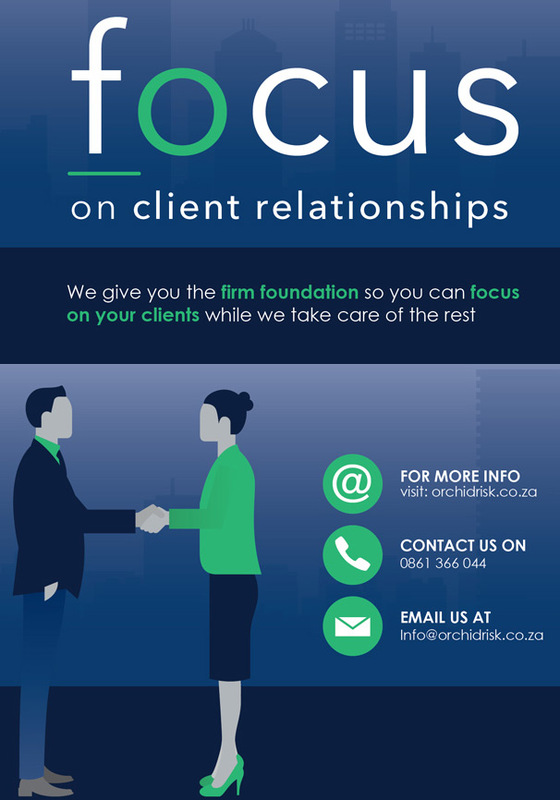 Orchid Risk Services™ | Orchid Risk Services - Short term insurance policy administrators and Risk Management consultants for independent FSPs, within South Africa. Orchid Risk Services provides risk management consulting and bespoke insurance policy administration services to selected Financial Service Providers (FSP’s). To be recognised and respected as the premier short term insurance policy administration Company in South Africa. Access to insurance markets not readily available to the FSP. White label Insurance product unique to the FSP’s client base. Complete short term insurance policy administration on a tried and tested industry leading IT platform. Manage an exit strategy when retirement becomes an option to the FSP. Orchid Risk Services provides risk management consulting and bespoke insurance policy administration. Talk to us about your solution. Stay up-to-date with our news. We don’t do spam. And we do not give your email address to any 3rd party. We’ll send you interesting and relevant insurance industry news. Success! Thanks for signing up to receive our newsletter.